In this study we examined the E-Learning strategies in rural higher educational Institutions. There are 480 students’ chosen from higher education (engineering colleges and Arts and Science colleges). This research identifies the managing E-Learning strategy among the higher educational institutions. The research adopted Stratified random sampling’ It is a probabilistic sampling option. Factor analysis was used to extract the data and One Way ANOVA is used for analysis. It focuses on Synchronous learning and Asynchronous learning practices among the students’ of higher educational institutions. The outcome shows the present e-learning services provided by the rural higher education. E-learning strategy, Higher education, Rural institutions. E-Learning is classified in two types synchronous and asynchronous. In synchronous learning, teachers and lecturers interact with themselves and each uses communication technologies such as video conferencing, web conferencing, chatting, and telephone conversation. In asynchronous learning, without live interaction the teacher’s use technologies such as CD-ROMS, Cassettes, e-mails etc. E-learning in educational institutions follows blended method, i.e. both synchronous and asynchronous. Schiffman et al. surveyed 738 US tertiary institutions which were engaged in online learning. What is interesting is that the institutions in the Schiffman study prioritised the recruitment of additional students’ from new geographical areas and new markets, while those in the Garrett and Jokivirta  study for grounded the enhancement of on-campus learning as their main reason for developing e-learning. This may indicate that the US institutions are far ahead in the implementation of e-learning and are now in a position to move beyond the campus. It may also reflect the more competitive environment in which many US universities operate. As noted above, the HEFCE e-learning strategy (2005) in England and Wales has stimulated an upsurge in e-learning strategy development, and the majority of UK universities now adopt e-learning strategies. Analysis of a sample of such strategies indicates that most universities have adopted a ‘bottom-up’ rather than ‘top-down’ implementation policy; they tend to foreground the potential of e-learning to enhance teaching and learning and to foster a wide variety of learning outcomes. In addition, staff training is seen as essential to successful e-learning but flexible support structures and mechanisms are seen as even more important Mac Keogh and Fox . Again this reflects that most institutions are a relatively in early stage of e-learning development.Klink and Jochems  suggest that it is time to consider e-learning as an integral part of academic activity and needs to be routinely supported so that e-learning can become almost obligatory to mission statements and strategic plans. the rise of the industrial e-learning paradigm is creating a growing perception for the need of institutional strategies to guide the implementation of e-learning. It is necessary for management to have a clear view of the purpose intended through the introduction of e-learning in order to determine the necessary work. Pratt  imitation is a component of management fashions, fads and bandwagons where a relatively transitory collection of beliefs can legitimize the exercise of mindlessness with respect to innovation with information technology. He suggests that the Australian university sector’s adoption of e-learning during the 1990s is an example of “fashionable” adoption of technology. Birnbaum  adds a list of fads adopted by higher education. In relation to institutional strategies for learning and teaching it was suggested that the search for a single blueprint was flawed, even naïve Newton . Similarly, there is no ready model or single clearly successful path for institutional e-learning strategies that will ensure e-learning is embedded. Oliver and Dempster  E-learning, for a variety of reasons, is characterised by high levels of variability, change and uncertainty Jones . Broadly technological innovation is said to be underdetermined in that there is no single “best solution” Allen  those who support a social shaping perspective suggest that e-learning in universities can follow many paths. Dutton and Loader , says that Information technology is one of a number of components of an emergent process of change where the outcomes are indeterminate because they are situationally and dynamically contingent Markus and Robey ongoing change is not solely “technology led” or solely “organizational/ agency driven”, instead change arises from a complex interaction among technology, people and the organization. the reliance of teleological approaches on top-down decomposition and the subsequent loss of the whole can also be seen in institutional approaches to e-learning Jones et al., . Describes how divisions between different areas of the Open University contribute to the lack of any one list of institutional requirements and the resulting contention between minimising cost and developing functionality. the differing outlooks of these separate divisions were not just divergent, they were contradictory. Fry , he expressed the view that universities had to compete in a global higher education market. E-learning initiatives will not only give universities a new channel of educational deployment, but also will also support strategic objectives by assisting asynchronous discussion consortiums and networked communities. the success of e-learning implementation depends on the institutional Structure that institutional leaders create within their institutions in preparation for the incorporation of any new technological innovations for improving the efficiency of their lecturers and the effectiveness of the pedagogical methods that lecturers use in disseminating educational material to learners. It is therefore necessary to explore HEI organizational structures that enable the adoption of e-learning. O’Connell  reported that the students’ from non-technical backgrounds or those who are more accustomed to traditional face to face learning environments, experience problems absorbing course material for e-learning, undergraduate students’ who are perhaps more assertive and motivated should be given focused training on how they can take full advantage of e-learning environments. IT skills can prove problems of students’ on distance learning courses and if the requirement for training is not addressed, students’ will not experience the full benefits of the e-learning environment Furthermore, a lack of IT skills is one of the main reasons for students’ non-participation in e-learning courses Whilst not looking to replace 'real' paper with technology based resource, it is the process of augmentation and enhancement with the 'traditional' resources to enable reflection, encapsulation, consolidation and extension of the written word. Frank Greenagel  suggests that the learning is often a gradual process that happens through a series of shaping activities, which are not always instructor-initiated. This is sometimes called tacit learning. the coaching process recognizes this, and so do many lab courses where we expect students’ skills will develop over the semester without explicit focus on those skills. Learning communities work; there is a social as well as cognitive dimension to learning. Students’ transform the information they get from instructors and texts into meaningful knowledge through conservations, arguments, lunches, discussion groups and other realworld activities. Garrison and Anderson , state that the dominant issue in education today is not to access more information. In fact, making sense of the quantity of material they are exposed to is a serious challenge for students’. the goal is to give students’ the abilities and strategies required to manage this overwhelming breadth and depth of information. In working towards this goal, educators began to realize that the only long-term solution was to construct an educational environment in which students’ would not only learn, but know where they would learn to learn. In this regard, the focus of education is shifting to the development of critical thinking and self-directed learning abilities that can serve the individual over a lifetime. the desired outcome of education, then, becomes the constructing of coherent knowledge structures that accommodate further learning, not the assimilation of specific bits of information. Ultimately education must prepare students’ to be continuous learners-once the rhetoric of high education but now the hallmark of the knowledge age. Philip et al.,  in their analysis suggest possible technological innovation strategies in higher educational institutions in Africa. the study deals with management issues in the implementation of eLearning with particular reference to its usage in higher education abroad including Africa, and also suggests appropriate approaches for technological innovation of higher education in Africa. the major findings of the paper, which are based on three case studies, suggest that e-learning needs to be implemented within a strategically developed framework based on a clear and unified vision and a central educational rationale. the findings further highlight the importance of using a combination of strategies--top-down, bottom-up and insideout-- during the diffusion process to attain coherence, collegiality and ownership. the process of technological transformation is not a smooth translation process but one of dislocations, dilemmas and uncertainties and it is an art to effect change and sustainable technological transformation since people are central to this transformation process. Chris Curran  has concluded that the e-learning strategies adopted by universities from the perspective of three common objectives are widening access to educational opportunity; enhancing the quality of learning and reducing the cost of higher education. the discussion is illustrated by drawing on case studies of universities in Europe and the United States. It is concluded that the most striking characteristic of the e-learning strategies adopted by universities is their diversity, and inherent characteristic of adaptability in use and flexibility in application. the implicit compatibility with institutional aims suggests that the e-learning strategies universities adopt reflect, rather than influence, institutional ethos and that by virtue of the capacity to adapt to different contexts, e-learning may be more adaptable – and ultimately less threatening – to academic more than some observers fear. Rajan and Sundar  observes that collaborative e-learning is an interactive process where users share the same information synchronously or asynchronously, though they are at different locations. E-mailing or file sharing is the least collaboration that could be done over the internet, intranet or extranet, and which may include a discussion by any other asynchronous mode. Synchronous collaborations using relevant groupware for webinars are real-time events, though they may be planned through e-mail. Conducting meetings, brainstorming sessions, holding technical symposia, webinars, and interactive e-learning programmes are some examples of synchronous collaborations. Collaborations are especially useful for individual tutoring and coaching. Often in the process of constant e-interactions learning takes place which may be an unintentional gain. Ezendu Ariwa and Rui Li  have reported that computer capabilities promise to improve both the quality and the extent of the learning experience, the project in this report also attempted to develop a learning community based upon computer technology. the main question in this report was whether it would be possible to obtain better learning quality and increased students’ activity, and to what extent this would depend on different approaches to using technology in the learning process. the UK Govt in 2005 has promoted the strategy of pedagogical innovation, to increase the deployment of learning technologies and enable e-learning in a way that directly addresses business opportunities and imperatives. It provides for equivalent and enhanced learning and support experiences for all Leicester students’. It offers a framework that not only develops and extends the range of services and approaches already in place but also looks to deepen understanding and deployment of learning technologies in the University. Strategic aims and targets are outlined. the key players, components and issues to ensure successful and achievable implementation are laid out. An agreed start up budget is specified. Research questions were considered as the first and the most important condition for differentiating among the different research strategies. Since, this research used a questionnaire to assess the e-learning strategy in rural higher educational institutions survey strategy was chosen. In addition, this research attempted to assess the e-learning strategy in rural higher educational institutions among the two different disciplines namely Engineering, Arts and Science. the research adopted ‘Stratified random sampling’ It is a probabilistic sampling option. the first step in stratified random sampling is to split the population into strata, i.e. section or segments. the strata are chosen to divide a population into important categories relevant to the research interest. the second step is to take a simple random sample within each stratum. This way a randomized probabilistic sample is selected within each stratum. Each strata should be mutually exclusive (i.e. every element in the population can be assigned to only one stratum), and no population element can be excluded in the construction of strata. Stratified random sampling is used instead of simple random sampling when the categories of the strata are through to be too distinct and too important to the research interest. (Investigators oversample in the smaller strata in order to increase their sample size, which is necessary to conduct proper statistical analyses).Factor analysis and standard deviation with percentage anlaysis is used in statistic data analysis. the population for the study consists of e-learning strategy in rural higher educational institutions from the discipline of Engineering and Arts & Science. the present research felt the population too exhaustive since there are many colleges in India. Nagapattinam is the rural district in Tamilnadu. Hence, as a representation of the e-learning strategy in rural higher educational institutions in Nagapattinam District at Tamilnadu the study identified its sampling frame as those colleges in Nagapattinam district. the research adopted stratified random sampling in selection of institution from the two disciplines. the respondents for the research were the Students’ of the different discipline and courses, which were selected at stratified random. the institutions have several courses but, only the computer based and management courses are preferred to get the sample. Every class has sixty numbers of students’ in engineering colleges and Art’s & Science Colleges. 40 samples were collected from each class of the course. 120 samples per college were collected. Finally four colleges were chosen for sampling. the sample was collected from two engineering colleges and two arts & science colleges. 120 (students’) x 4 (colleges) = 480 (samples).The samples were collected from final year students’ of both arts & science and engineering colleges. Data collected from discipline and courses are given below (Table 1). the samples were collected from same courses from two engineering and arts & science colleges. In that 720 students’ 480 samples were collected from four colleges. Such as MBA, MCA, BE-(computer science) from engineering and BCA, B.Sc (computer science), MCA from arts & science. Hence the sample size for conducting questionnaire was fixed as 480 (Figure 1). 1 Synchronous learning (video conferencing, web conferencing, chatting and telephone) is more effective. 2 Asynchronous learning (CD-ROMs, cassettes, e-mail) is more effective. 4 Usage of OHP is effective in learning. 5 The usage of power point slides is important in learning. 6 Usage of animation is necessary for learning. 8 You-tube is useful in classroom learning. 9 The on-line tutorial is useful in learning. 10 E-learning helps to get more marks. Table 1: Questionnaire used for research analysis. Figure 1: Frequency and percentage of e-learning strategy. Table 2 shows the value of 0.82. It is a good value and there is an adequate relationship in e-learning strategy. Table 2: KMO and Bartlett’s Test for E-Learning strategy. Table 3 has identified 10 linear components within the data set. So factor 1 explains 31.422% of total variance then extracts all factor with eigenvalues greater than 1 leaving with three factors. Table 3: Total variance explained for E-Learning strategy. The three factors extracted together is account with 53% of the total variance. the 10 factors get reduced into 3 factors. Before rotation, factor 1 is accounted for considering more variance than the remaining two(31.422 compared to 11.175 and 10.423). However, after extraction it accounts for only 21.252% of variance (compared to 17.166 and 14.602% respectively) and principal component analysis works on the initial assumption that all variance is common; therefore, before extraction the communalities are all1. the communality in the column labelled extraction reflects the common variance in the structure of data. the 53% is retained by the extraction of 3 factors out of the 10 original variables. Table 4 contains the rotated method of vari max with Kaiser Normalization that have been extracted. These are extracted factors. Table 4: Rotated component matrix for E-Learning strategy. Factor 3. We see that factor 3 has two variables. They are Synchronous and asynchronous type of learning which is more effective and has been loaded with 0.579 and 0.807. This factor consisting of the two variables are termed as “Types” (Figure 2). 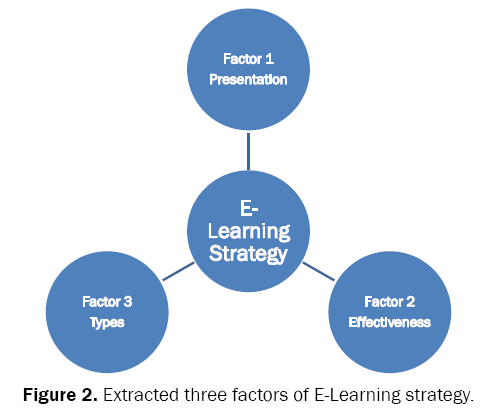 Figure 2: Extracted three factors of E-Learning strategy. E-Learning strategy of Presentation has the use of LCD projector, use of power point slides and animation which are necessary for classroom learning. the E-Learning strategy of Effectiveness has the You-tube classroom learning, the on-line tutorial learning and E-learning that helps to get more marks. E-Learning strategy of Types consists of Synchronous learning (video conferencing, web conferencing, chatting and telephone and Asynchronous learning (CD-ROMs, cassettes, e-mail) which give more effective teaching. 55% of the students’ strongly agree and 34% of them agree about E-Learning strategy of Presentation. the students’ answer about E-Learning strategy and its effectiveness is agreed by 46% and 30% of the students’ strongly agree.48% of students’ strongly agree and 38% agree the e-learning strategy Types. Therefore the result shows students’ prefer e-learning strategies of Presentation, Effectiveness and Types. the use of home computers has statistically significance between e-learning strategy and Presentation and Types. the use of pen drive for storing data has statistically significance between e-learning strategy and Types. New technologies and sophisticated learning methods are the symptoms for a major impact in technical institutions. The vocational and technical institutions need to change to accommodate the impact of e-learning. It is sure that impact of e-learning will require institutions to re-think of the strategies of teaching learning process. Much focus could be given in adopting ICTs and other technological advancements, nevertheless, e-learning certainly has made a prominent beginning in India and there are a quite a few vendors of e-learning as well as e-learning portal –developers. This is far surpassed by computer based training (CBT) using CD-ROMs and DVDs used in Indian educational institutions such as schools, colleges and Universities. the students’ are encouraged to be actively involved in getting access to the internet, e-mail, World Wide Web (WWW) for information, communication and education (ICE). E-learning and other related learning methods have contributed to the enhancement of the performance of our students’ at all levels of our education system, irrespective of individual differences due to heredity and environment. E-learning strategy factors of presentation and types have relationship with owning computer at home. Presentation and types of e-learning strategy have influenced those students’ having computers in Engineering colleges and Arts & science colleges. E-learning strategy factor types have relationship to the students’ using pen driver for storing data. the result shows that the students’ are using pen driver for storing data of materials. the e-learning strategy factor types are considered by the students’. It helps the students’ to use pen driver for their purpose of getting their materials in soft copy through e-learning. E-learning involves the delivery and administration of learning opportunities and support via computer, network and web-based technology to help individual performance and development. E-learning can provide the tools to meet that challenge. Retention for a learner varies, based on content type and the delivery vehicle. the better match of content and delivery vehicle to a learner’s style, the greater the retention and therefore the greater the results. E-learning activity like pedagogy, curriculum design and development will help to enhance excellence and innovation in teaching and learning, students’ achievement, improving employability and skills attracting and retaining learners. the quality will and support enhance benefits of all the students’ and faculties in learning. Hence it is concluded that the issues and strategies of managing e-learning services in rural educational institutions at Nagapattinam district is considered a beginning and it will be established soon because of the competition in educational industry among the Engineering Colleges and Arts & Science colleges. the rural colleges are developing their facilities in e-learning and the institutions show their capacity full-fledged in future. Thus the rural district like Nagapattinam district will grow with several Engineering colleges and Arts & science colleges with managing e-learning strategy. Allen M. “Putting the learning back into e-learning”. Online corporate university week conference, San Francisco, CA. 2000. Garrett R and Jokivirta L. Online learning in commonwealth universities: selected data from the 2004 observatory survey, part 1, report no.20.London: the Observatory on Borderless Higher Education. 2004.